The formula for theater is not always cut and dry. The way audience and production interact is changing. Changing into something wondrous. With new theatrical events popping up all over the place, the nuances of testing the limits of an audience are becoming more and more stimulating. 5 Senses Theatre’s krav gives you the ultimate theatrical social experiment masked as a supper club. With no two experiences ever being alike, krav features a 4 course Cajun tasting menu and wine pairing prepared by expert chef Rick Martinez in addition to a swanky social gathering where mixing and mingling with a stranger is encouraged. With food and drink being the glue that brings everyone together, what happens when all the guests have arrived is what makes this evening simply extraordinary. Though the intent is not to insult with the reference and though they are actually quite different, krav is almost the equivalent of "The Joe Schmo Show", a "fake" reality show where a set of actors had to make an unsuspecting Joe believe he was a participant on a "real" reality competition show. For those who remember, that show featured a virtually unknown comedian named Kristen Wiig as Dr. Pat, a darling plant who nearly blew the entire cover when she got injured in a competition. I compare the two because the audience of krav has no idea who is who. If you have trust issues, leave them at the door because the darling girl you sat next to during the four course meal may not actually be an actor and actually be a "real person". The set up is simple. 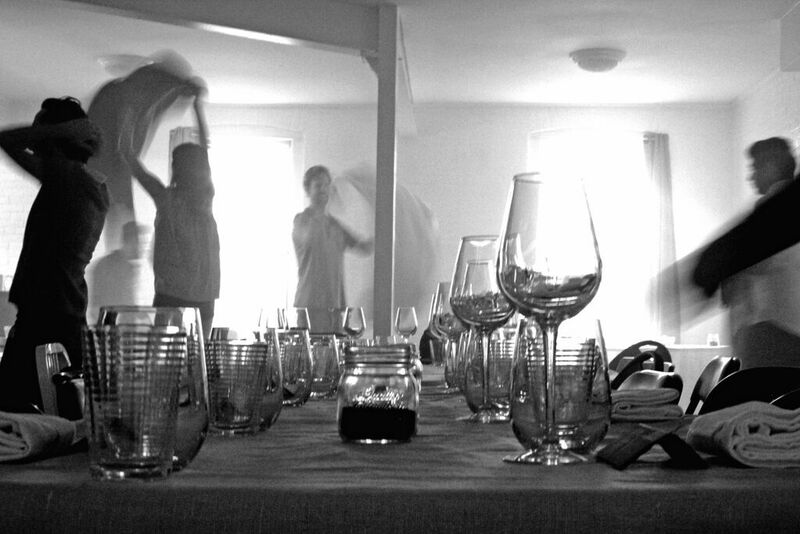 A group of guests are invited to an apartment for a dinner party. What ensues is an evening of truths, lies, loss of inhibition, and an incredible gourmet meal. This is a work that defines the power and intricacies of personal relationships. How do you interact with a complete stranger as you wine and dine with talking points ranging from escaped convicts to AOL Instant Messenger names. With a basic structure composed by Jason Aguire, every evening will be drastically different depending on the makeup of the audience and who you're fortunate to be sitting with at the table. From a theatrical standpoint, krav keeps the atmosphere genuine. Mood music fills the room. A giant table splits the space. And a set of rules is placed on the wall. Be sure to follow them because those who disobey will be shone the door. Once the food is served, it’s nothing short of a flavor explosion. The tour of the South includes sensational Cajun Fried Oysters with garlic aioli and pickled fresno peppers, Spicy Glazed Short Ribs that melt right off the bone, and Strawberry Rhubarb Bread Pudding which truly makes for a happy ending. I’ll never consider myself a food connoisseur just an avid eater, but Chef Martinez’s menu was simply divine. Upon reading the cast list at the end of the night, I realized I had cracked the entirety of the acting company. A win for me. Others were completely shocked that their neighbor lied and deceived. Great acting I suppose. And that is what's absolutely fascinating about krav. The entire experience is driven by you and your peers. As an avid fan of “Big Brother”, the ultimate social experiment, krav was the closest thing to actually playing that game. And getting to have that adrenaline rush for the night was simply thrilling. A moment I want again. Whether you view it as immersive theater or a cousin to the Escape the Room trend krav and 5 Senses Theatre are on the pulse of the future of theatrical experiences. When the next iteration rolls around, expect a night you'll never forget and won’t stop talking about. It's a must.